Creamy and easy, this healthy roasted butternut squash dip is a delicious appetizer, with tahini and yogurt is one that everyone will love. If you are looking for easy and guilt free holiday appetizers, look no further! 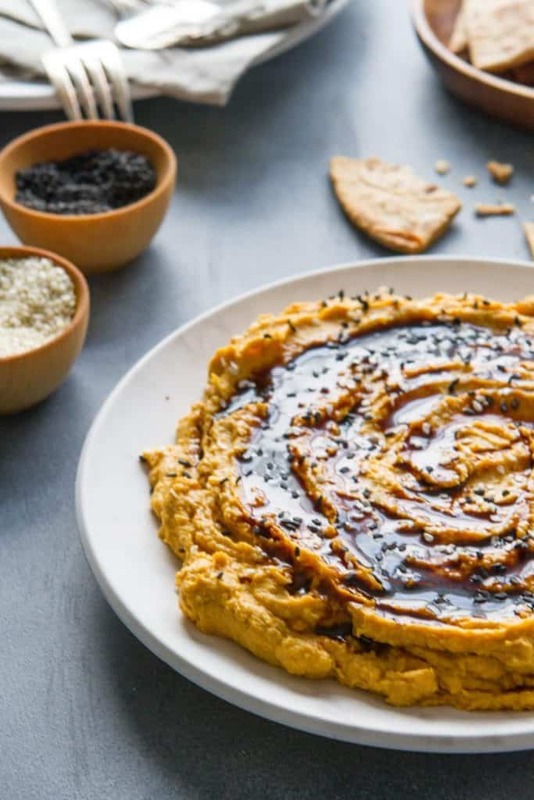 This Healthy Roasted Butternut Squash Dip is just what you need. I love this dip… for so many reasons. Ok, let’s start with the color.. it’s gorgeous!!! No fussy presentation you have to labor over – just spread it on a pretty plate and drizzle over the date syrup (more on that in a minute!) 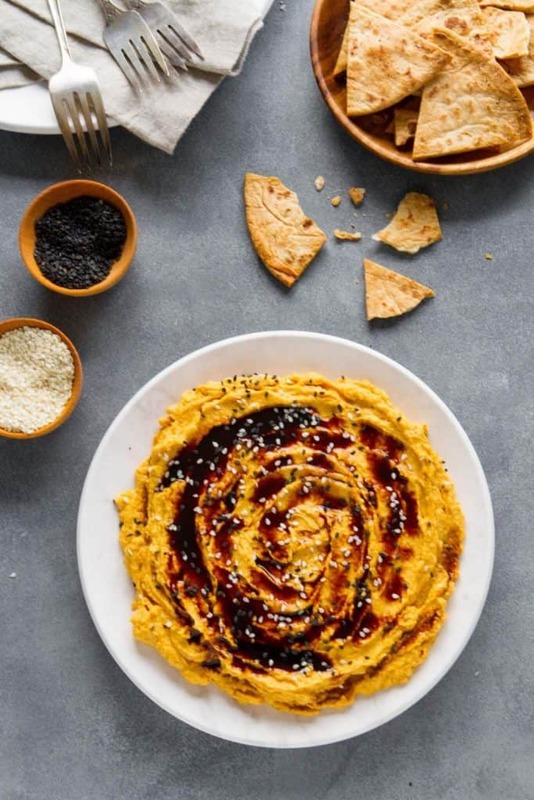 This Healthy Roasted Butternut Squash Dip would be fabulous as part of a Thanksgiving spread or to start off any fall party you have in mind. 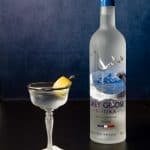 Not to mention it will carry you straight through the holidays – which is also another reason to love it. Easy… honestly, this dip is easy, easy, easy! 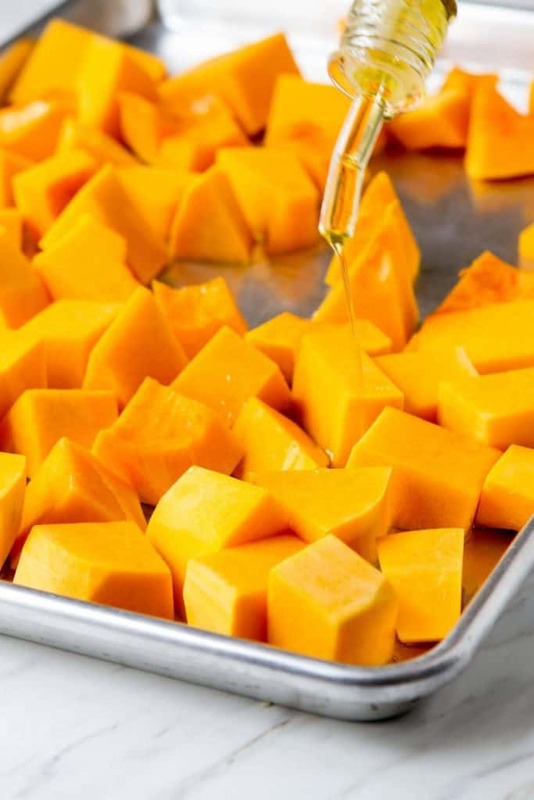 You start off by roasting butternut squash cubes.. and yes, the “cube” part is critical because you want all that lovely caramelization – roasting a halved butternut squash just won’t deliver the same flavor! Once you’ve roasted the squash, you just dump it into a food processor or a blender along with some tahini paste, greek yogurt and a little garlic and blend it up a bit. 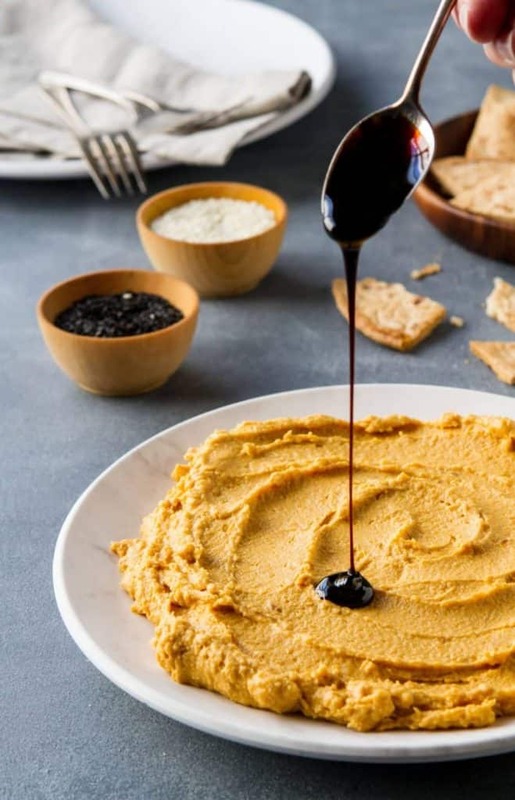 That’s it – healthy, roasted butternut squash dip! 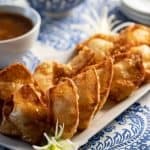 Then, when you are ready to serve – today, tomorrow or a few days later- just drizzle on some Date Molasses and sprinkle on some sesame seeds. Put out some pita (or sliced red bell peppers and cucumber) and… your done. 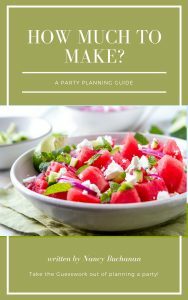 If you’ve been reading this blog for any time at all.. well you know how I feel about ANYTHING I can make ahead!!! Seriously, don’t we all need those types of dishes during the holidays?? Yes, yes yes!!!! Alright, now that I’ve convinced you that you absolutely need this recipe, let’s talk a little about this whole Date Molasses thing. And yes… it’s a “thing”! 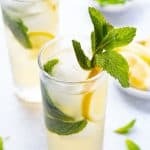 You can find it in virtually any Middle Eastern market – which, if you haven’t visited one I highly recommend you do and stock up on all kinds of goodies! 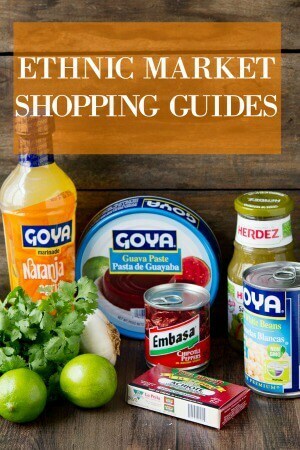 Don’t forget to take a copy of my Middle Eastern Market Guide with you. 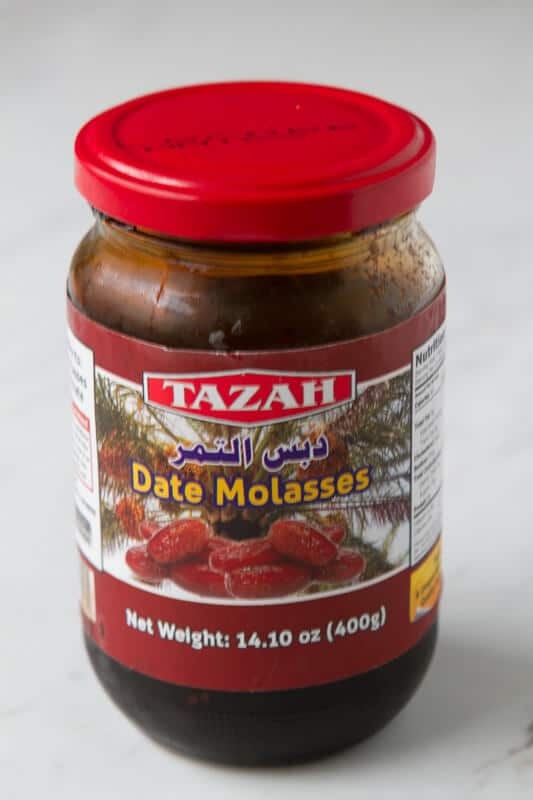 So, this Date Molasses is pretty much exactly what it sounds like – a syrup made from dates! It has a sweet and almost smoky flavor similar to actual molasses, but without that muddy, almost acrid aftertaste that molasses has. 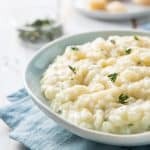 Aside from drizzling on this dip, the molasses is fabulous in a dressing (with some red wine vinegar) is delicious drizzled over plain vanilla ice cream or used a a sweetener in bourbon cocktails!!! But… what if you can’t get to a Middle Eastern market? No worries!! You can easily drizzle a little maple syrup on the dip or even mix a little molasses with honey! 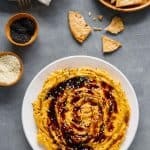 It’s forgiving like that… and just another reason why I love this healthy roasted butternut squash dip!!! This is a fabulous vegetarian fall dip that can be made 2 to 3 days ahead of time so it's perfect for entertaining!! Author: Adapted from Yottam Ottolenghi. If using a whole butternut squash, peel and seed and cut into 2 inch chunks. Spray a sheet pan lightly with cooking spray. Spread squash on the pan and drizzle with 1/4 cup olive oil. Toss squash to thoroughly coat in oil. Sprinkle with salt and cinnamon. Cover pan tightly with foil, crimping the edges. Remove pan from oven and stir the squash. Cover and roast for another 30 minutes or until the squash is very tender. Remove the pan from the oven and remove the foil and let cool. When cool, add the squash, tahini, yogurt and garlic to a food processor or a blender. Blend until the mixture resembles a coarse paste - about 2 - 3 minutes. If serving right away, spread the mixture on a serving platter. If making ahead, transfer mixture to a sealed container and refrigerate. Drizzle with date molasses or maple syrup and sprinkle with the sesame seeds. 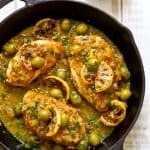 Fabulous, beautiful dish just perfect for holiday entertaining and healthy to boot. WINNER! !